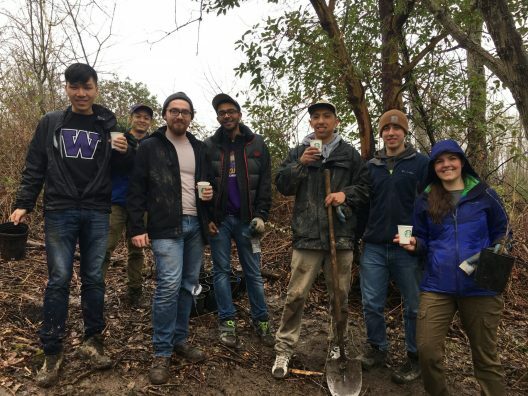 In the Ecological Restoration Capstone, students of different academic backgrounds work together with a Community Partner (CP) to complete a local restoration project. Students learn how to plan, design, install, monitor, and maintain a restoration project while working in teams. The capstone spans three academic quarters beginning in the fall. From 1999 to 2016 the capstone has completed 102 restoration projects with 45 different CPs, involving 590 students from 35 different academic majors. Community Partners, including local governments, schools, utilities, non-profits, and private firms, submit a Request-for-Proposals (RFP) to UW-REN outlining the ecological problems and opportunities for their site. UW-REN faculty review the initial RFP to evaluate if it is an appropriate match for a student capstone project, that it can meet both academic goals and the needs of the CP. UW Students from all disciplines are eligible to participate in the Restoration Ecology Network Capstone. Students are strongly encouraged to take either general ecology or plant ecology before starting the program; questions about eligibility should be referred to the UWREN advisor. Students are placed into interdisciplinary teams and work with their site’s community partner (CP) to understand the history of the site as well as assess its current ecological condition and social context. Student teams respond to their CP’s request-for-proposal with a restoration proposal that considers site condition and context, CP desires, ecological potential, student team capacities, and a variety of project-specific constraints. Student teams iteratively develop a detailed project design document with feedback from faculty and their CP. Project implementation usually begins, with site preparation, installation of plants, habitat structures, erosion control features, and other project-specific elements. The exact timing of events dependent upon the specific project. Students work with their CP to build interest and capacity in the surrounding community for being involved with project implementation, and eventually care of the site in later years. Students complete project installation, overseeing work with members of the surrounding community. Often student teams are involved with local K-12 schools during this process. The student team prepares a stewardship plan that details site monitoring and maintenance and train the CP to ensure their project’s long-term success. The course concludes with an evening poster session and celebration.